Producing and Writing "Forgotten Ellis Island"
During her 25-year career of producing television, Lorie Conway has been the recipient of many national awards. Her most recent film, Forgotten Ellis Island (narrated by Elliott Gould), is the recipient of three National Endowment for the Humanities grants, and is the first film to be produced about the abandoned immigrant hospital on Ellis Island. 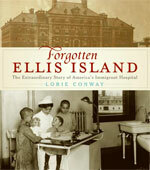 She is also the author of the companion book Forgotten Ellis Island: The Extraordinary Story of America’s Immigrant Hospital (Smithsonian/Collins). The film premiered in the Ellis Island museum (October, 2007) and will be broadcast nationally as a prime-time special on PBS in 2008. An abbreviated version of the film will be shown daily at Ellis Island. Currently, she is conducting screenings and book talks about the decade-long film and book project. For two years, the National Park Service gave exclusive access to Conway’s production company to film the massive, 22 building medical complex adjacent to Ellis Island. The General Hospital of Ellis Island was the nation’s (and perhaps the world’s) largest public health hospital, capable of housing as many as a 1000 patients and employing 300 people. The hospital was unquestionably the world’s boldest institution of its kind – it stood ready to treat virtually any disease found anywhere on the globe. Conway’s film and book are as much about the patients as the hospital. She presents the stories of immigrants for whom their first encounter with America was the physical examinations on Ellis Island. The film and the book are a powerful tribute to the best and worst of America’s dealings with its new citizens to be – and those who were not so lucky. 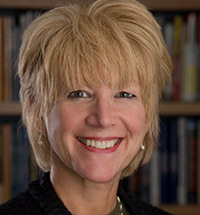 Conway’s other productions include The Incredible Voyage of Bill Pinkney (WCVB/Boston), which she produced and wrote, and for which she received the Peabody Award and the Cable Ace Award; Fortunate Son, one of the many programs she produced for Chronicle, the acclaimed nightly newsmagazine, and for which she received the Columbia University DuPont Award. Her documentary Conquering the Cape received an Iris Award. As an independent producer, Conway’s work for public television includes: The Life & Times of John Kenneth Galbraith, Boston: The Way it Was, The Jews of Boston, and Fabulous Fenway, a commemorative history of Fenway Park, America’s oldest major-league ballpark. Conwayheld one of Harvard University’s distinguished Nieman Fellowships in 1993-94 in recognition of her work. Currently, she is Vice President of the Nieman Foundation Advisory Board and also serves as an Associate of the Boston Public Library. An avid runner, she has run the Boston Marathon seven times as well as covered the race as a reporter and field producer. As founder and director of Boston Film and Video Productions, Conway resides with her family in Boston, Massachusetts.